What: Online ideas forum to crowdsource ideas from residents. Result: The Income Generation Ideas Lab helped the council gather over 240 ideas from people about how the council could raise new funds to offset the impact of government cuts. 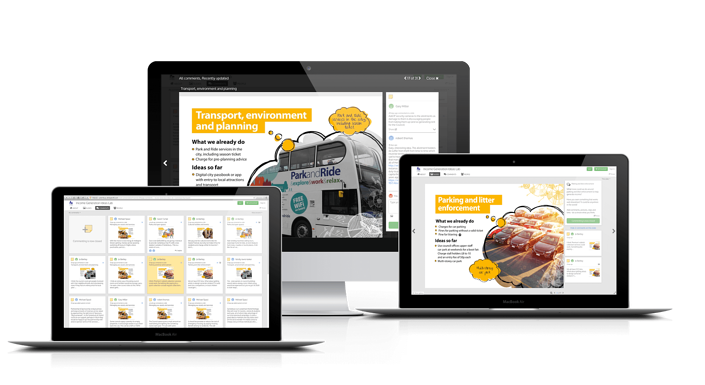 In January 2016 Canterbury City Council’s marketing and consultation team used Stickyworld to run a creative online ideas forum. They wanted to crowdsource suggestions from local people on how the council could raise new funds to offset the impact of government cuts. In order to address the shortfall in the level of current local government funding, Canterbury City Council needed to find new ways to generate its own sustainable sources of income to achieve financial self sufficiency by 2020. They set up an Income Generation Working Group to set about learning from others and gathering suggestions from local residents, stakeholders, councillors and council staff on how to achieve this. From the outset they realised that they needed a creative and participative approach and to foster a ‘no idea is a bad idea’ culture. They were looking for an engaging way to reach new audiences to reach as many people as possible to get them involved in sharing their ideas. The council’s marketing team set up an online Income Generation Ideas Lab hosted on their Canterbury City Council Stickyworld portal. This created an opportunity for local people to understand the mission, get involved and share their ideas which was available 24/7 over a three week period. The team created an interactive slideshow to present and explain to people the issue about funding, the council’s aims and their desire to be proactive and inclusive to find solutions. 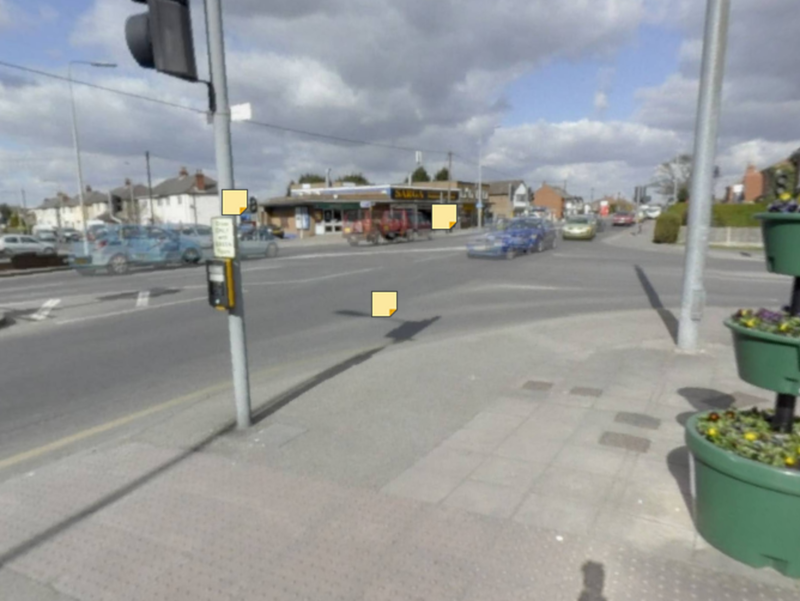 Using Stickyworld’s commenting features they then asked and encouraged people to leave ideas on a range of themes from parking and litter enforcement to transport, environment and planning. People were able to respond by leaving text, photos, links to online resources to explain and illustrate their feedback. The Stickyworld platform made this really quick and easy to do. The online ideas lab supplemented and extended the Working Group’s other activities including a face to face residents’ workshop. 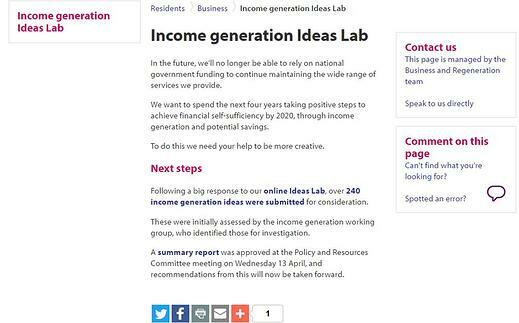 The council promoted the Income Generation Ideas Lab widely at stakeholder meetings, press and via the council’s website and social media channels to get as many people commenting as possible. When it came to analysing the ideas it was simple to download a list of comments from the Ideas Lab. In total the team were delighted to receive over 240 ideas (the list is available here). Some ideas were deemed worth investigation and are being taken further by the council. Canterbury City Council used Stickyworld to support a really creative ‘bottom-up’ and citizen- focused approach to solving a crucial budget issue facing local government. By adopting such a transparent, open and inclusive approach for crowdsourcing ideas they were able to reach and encourage many people to get involved, achieving a great result from their online engagement. The Income Generation Ideas Lab helped them build a common understanding of the financial pressures faced by the council, and created a place for innovation and ideas to flourish. To see the room, click here. To learn more about this or similar case study projects, book a free webinar demonstration with our team.